We love singing and signing in schools! We have many years of experience of running sessions in various school settings including mainstream primary schools and SEN Schools for children with MLD/SLD/PMLD & ASD and/or physical disabilities. We love rainmakers and rubber spiders! 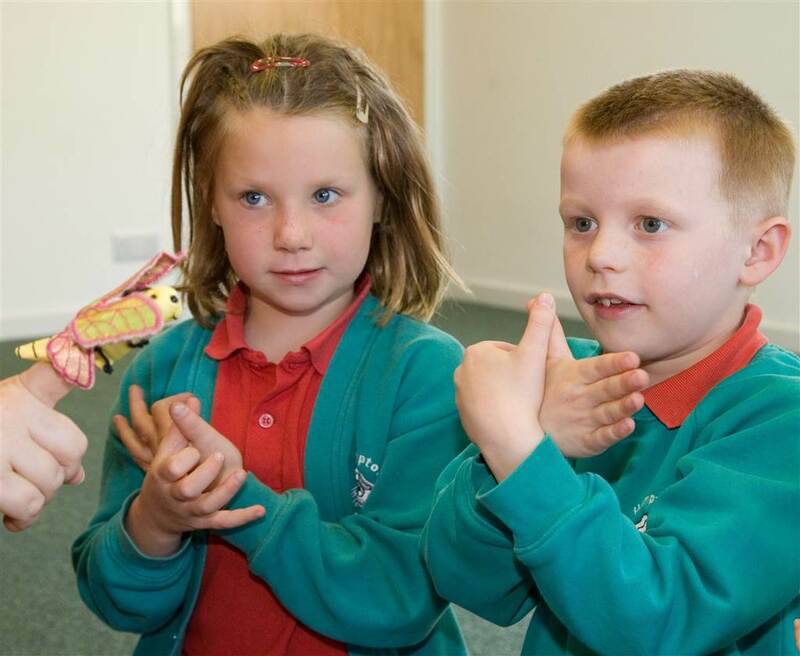 In mainstream settings, Singing Hands Makaton-signed sessions are a fantastic way to encourage all the children in your school to develop their Makaton signing skills. By joining in with a Singing Hands session, we also hope to inspire your staff members who have already completed their Makaton training on how to refresh and apply their signing knowledge and how to reinvigorate their approach to delivering rhymes and stories with the children at your setting. We also hope to encourage non-signing staff to see how easy it is to apply through songs and stories so that they feel motivated to attend their Makaton training as soon as they can. Makaton is what we call a ‘use it or lose it’ skill, so we hope to show staff how to use the signs through activities on a daily basis to keep up their signing skills. Each school session starts with a signed story and/or key words relating to a topic being covered by the Year Groups. Sometimes we are invited to come in for ‘Disability Awareness Week’ or ‘Book Week’ and can adapt themes for our sessions as required. 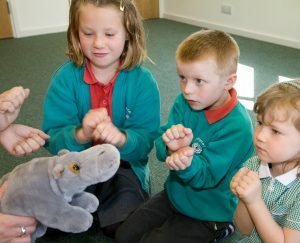 After the keywords and story, we move onto the singing with our lively range of multi-sensory Makaton signed songs about emotions, feelings, farm animals, jungle animals, mini-beasts, the weather, transport, colours, numbers and much more. 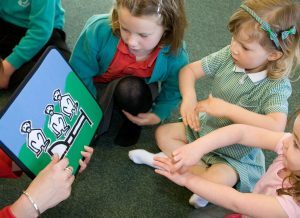 We bring everything we need with us including our exciting range of visual, tactile and auditory props for the children and staff to enjoy. Time for the rainbow song! 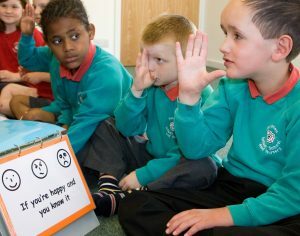 By adopting a Makaton-based approach in your setting, you can help encourage communication between children with SEN/EAL and their peers by fostering an inclusive approach to language – signing with all the children will help you achieve this. Over and again we have seen how much the children without additional needs have loved learning how to sign as well – and what better way to break down communication barriers can there be? 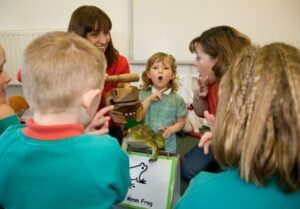 In an SEN setting, you may already be doing lots of signing but our sessions can often help revitalise your signing approach by giving staff new ideas of how to employ the signs in songs and stories. 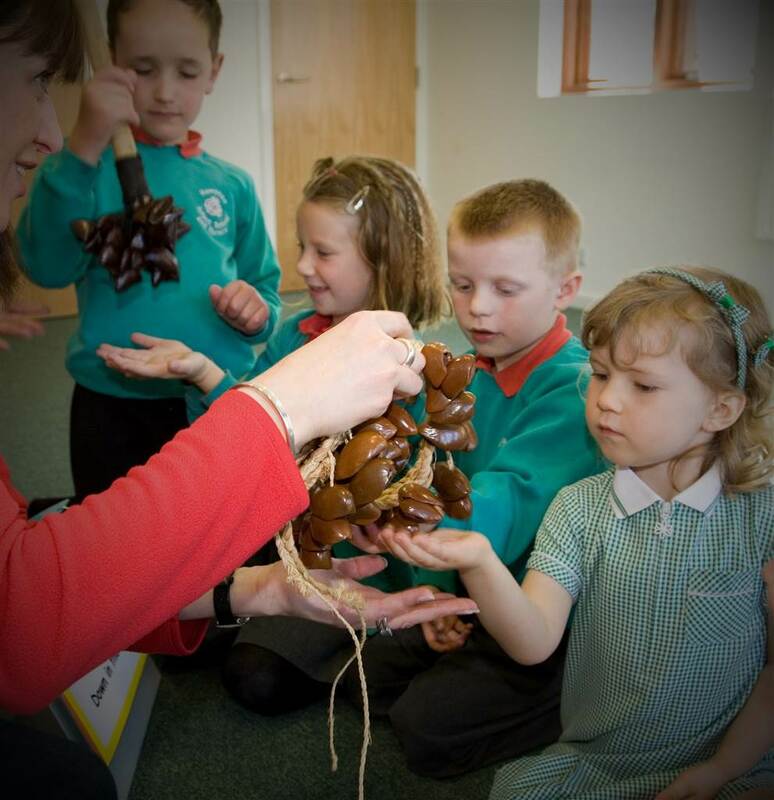 Our sessions in SEN schools have a similar format to our mainstream sessions by incorporating keywords, topics, stories and songs but the focus is usually with smaller groups of learners across the day alongside their support staff. We have a vast repertoire of songs ranging from nursery rhymes through to pop songs & show tunes – so we can provide sessions for all your learners from early years through to college. In SEN settings we can also adapt to bring additional sensory props to suit the needs of the learners involved in each group. Our multi-sensory approach is the perfect vehicle for learners of all abilities to practise their signing and enjoy making music together. If you are interested in Singing Hands coming to your school to run a session with your children and staff, please contact us (using the button below) and let us know your requirements. If you are looking for staff training and/or Makaton training for your staff only, please contact the team in the office and they will be able to help with your enquiry. Thank you so much for coming to visit our Early Years and making our day one of the best we have had at Stanwell Field CofE Primary School! Both the children and adults absolutely loved the sessions and we were so sad when it was over. We were all so engaged and learnt so much through song, movement and Makaton. 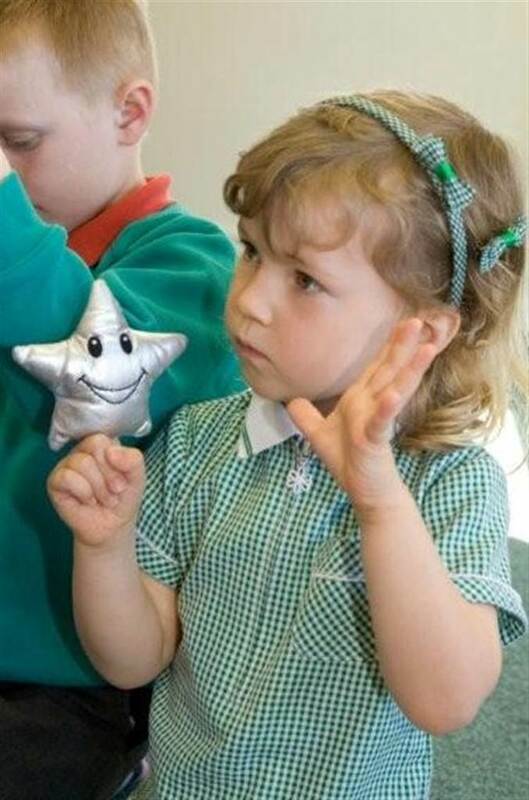 We now use the Makaton we learnt from you daily in class and the children have a deeper understanding of Makaton. We simply cannot wait for you to visit the school again. I cannot recommend you enough to other schools, groups and organisations that work with young children – an organisation you will never want to be without again! Singing Hands have been part of our Creative Arts Fortnight for many years now. The children are filled with excitement when they hear they are coming. 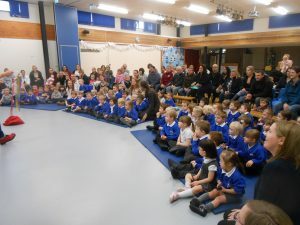 At Tolworth Infants, we have two Specialist Resourced Provisions for Children with moderate to severe learning difficulties (The Harbour and The Lighthouse), we use the Singing Hands DVDs and CDs daily with the children…..Suzanne and Tracy always think carefully and link their songs to our topic. Singing Hands benefit all our children during the visit and our children from Harbour and Lighthouse are our experts for the day. The props that they bring are always stimulating and exciting, filling the children with awe and wonder. 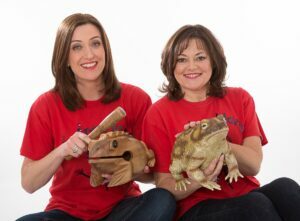 Suzanne and Tracy have a wonderful knack of engaging their audience, staff included. 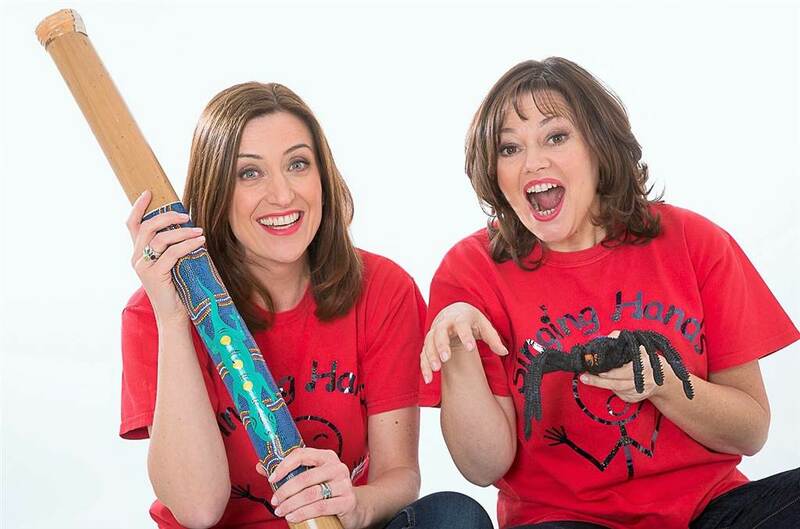 Thank you Singing Hands for our ‘most looked-forward to’ event of the year! We were delighted that Singing Hands accepted our invitation to visit Woodhall Community Primary School in Suffolk. We were entertained through the amazing world of signs with songs, rhymes, stories and games. Staff, children, parents and grandparents went away full of enthusiasm after watching Suzanne and Tracy in action. We had such positive feedback following the visit and it has definitely got everyone talking, asking and wanting to know more about Makaton – so thank you for making it a truly memorable day in which whole families could be involved. We had a fantastic day – the children and staff loved it. 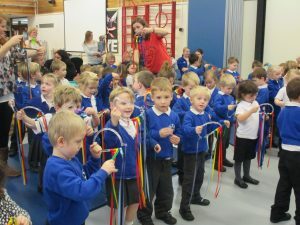 The pupils were engaged, happy and were able to use their signing skills in a fun and interactive way. We were particularly happy that each age range was catered for with great songs and signs. This is something we really appreciate, as with the younger pupils it can be a challenge to be at the right level for them. The day all went to plan and a special thank you again for giving us three lovely concerts! Singing Hands were absolutely fantastic! None of our families could resist, they were all engaged and involved throughout the show. our parents and families had a great time – worth every penny! Just wanted to drop you a note after your visit last week. Everyone really enjoyed the workshops and the children had a great time. Many of the staff raved to me how great they thought it was and one teacher wishes you could come every week for her class! Thanks very much for a lovely day and we have taken lots from it and hope to see you again. The Spring Term at Lindon Bennett School for children with severe learning difficulties ended with two magical concerts led by Suzanne and Tracy of Singing Hands. These two Makaton experts brought the songs to life with their enthusiasm, sense of fun, choreography and boundless energy. Every child (and staff members alike) was totally absorbed by their charisma and maintained concentration for the whole of the sessions joining in wherever possible. It was without doubt the perfect ending to a long and busy term and one we will certainly repeat.